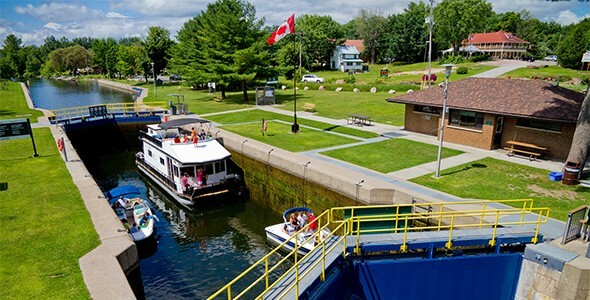 The Honourable Leona Aglukkaq, Minister of the Environment and Minister responsible for Parks Canada, has announced infrastructure investments totalling more than $285 million across the Trent-Severn Waterway in Ontario. Minister Aglukkaq was joined by Rick Norlock, Member of Parliament for Northumberland–Quinte West, Daryl Kramp, Member of Parliament for Prince Edward—Hastings and Bruce Stanton, Member of Parliament for Simcoe-North. This major investment includes the replacement of the Brighton Road Swing Bridge, major repairs or replacement to locks and dams as well as the repair and rehabilitation of several other bridges throughout the Trent-Severn Waterway. This investment will help to ensure that the Trent-Severn Waterway is protected and secured for the future while also creating and protecting jobs and opportunities. Successive groups of Aboriginal people travelled the ancient natural waterway formed by the waterway lakes, thousands of new Canadians were employed in the construction of its locks and dams, and today countless people benefit from the tourism economy that it affords.